I am the Social Media Executive for Illamasqua and look after the Illamasqua blog and our facebook, twitter and youtube channels. I also work closely with our fabulous blogger followers. Every day is exciting as we watch our community grow and evolve! The Theatre of the Nameless collection saw the launch of our first Powder Blushers with shimmer, something we eagerly awaited in HQ! 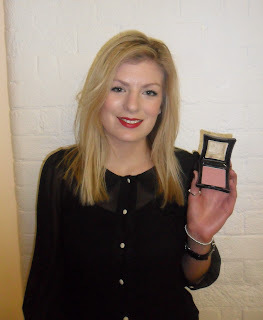 Powder Blusher in Ambition has been my favourite piece for this year. It’s warm, neutral tones make it wearable and the subtle shimmer adds a beautiful highlight to the skin. There have been many highlights in 2011; from watching the brand expand and explore new cities and countries, to indulgent and vintage events such as the Glamour of the Gods in the National Portrait Gallery, to innovative and intoxicating launches like Freak. 2011 has been a fantastic year to be a part of the Illamasqua family!